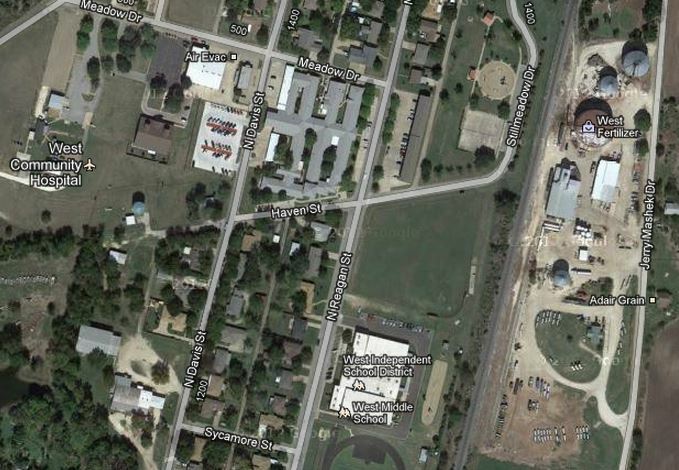 Google Maps satellite view of West Fertilizer and its proximity to West Middle School, along with many houses and apartments. Who needs pesky safety regulations or zoning laws when there is money to made running a fertilizer plant? Sadly, the small Texas town of West, which is just north of Waco, is suffering the consequences of unregulated free enterprise today, as a massive explosion at West Fertilizer has leveled much of the town. Perhaps the only remotely fortunate aspect of this tragedy is that it occurred at 8 pm local time and so West Middle School, which burned after the explosion, was not full of children. A look at the satellite image above shows the folly of putting “free enterprise” ahead of sensible zoning laws. At almost 20 miles north of Waco, Texas, one thing that is in abundance in the region is open space (I’ve driven past this spot several times in the last two or three years–it’s desolate), and yet this fertilizer plant is immediately adjacent to a large apartment building (see the photo at the top of this article for how that building fared in the explosion) and very close to a middle school. There is no reason at all for any other building to be within two or three miles of a facility that produces material that is so explosive. The town’s volunteer firefighters responded to a call at the plant about 6 p.m., said Waco police Sgt. William Patrick Swanton. Muska was among them, and he and his colleagues were working to evacuate the area around the plant when the blast followed about 50 minutes later. Muska said it knocked off his fire helmet and blew out the doors and windows of his nearby home. Five or six volunteer firefighters were at the plant fire when the explosion happened, Muska said, and not all have been accounted for. One of the worst disasters in Texas history occurred on April 16, 1947, when the ship SS Grandcamp exploded at 9:12 A.M. at the docks in Texas City. The French-owned vessel, carrying explosive ammonium nitrate produced during wartime for explosives and later recycled as fertilizer, caught fire early in the morning, and while attempts were being made to extinguish the fire, the ship exploded. The entire dock area was destroyed, along with the nearby Monsanto Chemical Company, other smaller companies, grain warehouses, and numerous oil and chemical storage tanks. Smaller explosions and fires were ignited by flying debris, not only along the industrial area, but throughout the city. Fragments of iron, parts of the ship’s cargo, and dock equipment were hurled into businesses, houses, and public buildings. A fifteen-foot tidal wave caused by the force swept the dock area. The concussion of the explosion, felt as far away as Port Arthur, damaged or destroyed at least 1,000 residences and buildings throughout Texas City. The ship SS High Flyer, in dock for repairs and also carrying ammonium nitrate, was ignited by the first explosion; it was towed 100 feet from the docks before it exploded about sixteen hours later, at 1:10 A.M. on April 17. The first explosion had killed twenty-six Texas City firemen and destroyed all of the city’s fire-fighting equipment, including four trucks, leaving the city helpless in the wake of the second explosion. No central disaster organization had been established by the city, but most of the chemical and oil plants had disaster plans that were quickly activated. Although power and water were cut off, hundreds of local volunteers began fighting the fires and doing rescue work. Red Cross personnel and other volunteers from surrounding cities responded with assistance until almost 4,000 workers were operating; temporary hospitals, morgues, and shelters were set up. Probably the exact number of people killed will never be known, although the ship’s anchor monument records 576 persons known dead, 398 of whom were identified, and 178 listed as missing. All records of personnel and payrolls of the Monsanto Company were destroyed, and many of the dock workers were itinerants and thus difficult to identify. Almost all persons in the dock area-firemen, ships’ crews, and spectators-were killed, and most of the bodies were never recovered; sixty-three bodies were buried unidentified. It would appear that Texas has learned very little from that disaster and still chooses to sacrifice volunteer first responders at the alter altar of free enterprise. Special FREEDOM bonus: Did you notice the name of the street to the west of the middle school? It’s North Reagan Street, because, well, freedom. 1) Was it really a “plant” as opposed to a co-op that was more generally concerned with storage and distribution? Does seem there was some mixing there, but unclear how much. 2) What exactly exploded? The compound used in the post in ammonium nitrate, but my understanding is the bulk raw material the facility had was anhydrous ammonia. It is not scheduled as overly flammable or explosive in its raw form. So, what really exploded? 3) What was the mechanism of the explosion? Was there a hydrogen buildup? Did an otherwise started fire combust an anhydrous ammonia pressurized tank? 4) What caused the original fire? @Jim White: Thanks. That basically asks the same questions though. Also, it appears that there was also significant grain storage at the site or immediately adjacent to it. What is their status? Did they explode too? The Houston Chronicle says the whole area is being treated as a crime scene. Looking at The Dallas Morning News now. It’s a very small town (under 3000 people), so probably a volunteer fire department. Also, Texas isn’t into land-use planning and zoning outside incorporated areas, and I understand the plant was there before the town. I heard that no one in the nursing home was killed, though. Ammonia is flammable. It has been considered as an alternative fuel to hydrocarbons for internal combustion engines in special circumstances. Its close chemical relative, hydrazine, is well-known as rocket fuel. It also is explosive, although the limits in air are relatively narrow. The reports seem to be saying that there wasn’t a large enough amount of ammonium nitrate at the plant to have exploded that way. There may have been propane tanks as well as ammonia tanks on site. Exploding tanks combine the energy of combustion with the energy stored in the compressed gas. This can be quite enormous. The tanks would have been heated (more stored energy) in the fire until the metal weakened enough to burst, whereupon the explosion. This seems to me to be the most likely scenario on the basis of the information I now have, but your questions still need factual answers. And I would add the question: What started the fire? Even though we still don’t have all the information on the exact type of facility this was, what was done at the site and what was stored there, the basic points of the post remain: the power of the blast and its proximity to homes, apartments, the nursing home and schools stands as symbolism of the drive by free marketeers to place profits ahead of people and put dangerous materials where they should not be. With proper safety precautions and zoning, this tragedy would not have happened, even if the trigger for this event turns out to be intentional rather than accidental or the result of negligence. How far away is Somalia now? Jim, I do appreciate your John Galt angle on this story, but I’m more inclined towards a criminal action here. You mentioned McVeigh’s fertilizer bomb at the federal building in OK City, but did not note that the bombing occurred on April 19th, the anniversary of the FBI attack on the Branch Dividian’s compound at…Waco, TX. John Galt and his creator Ayn Rand would not care if people die and in fact the experts say they would get a dopamine rush from thinking they helped cause the suffering. These are the people dictating our future right now and it will and must change soon. I think this article is a little misguided. If you actually pull up the town in Google Earth, you can see that the plant is at the very Northwest edge of the town. Based on this (and the condition of the what can be seen of the buildings at the plant) I would bet serious money that urban sprawl was the reason homes and schools are so close to the plant. People probably built homes around the plant because land was cheap and the accident did not occur because of some evil capitalistic conspiracy or the “consequences of unregulated free enterprise today”. The Galt angle is relevant because of the proximity of the buildings and the lack of full time firefighters with such a dangerous site in a municipal area. Had this blast occurred 20 miles out of town, it would be a different story. @Joey: Uhm, I mentioned poor zoning as part of the unregulated free enterprise. And poor zoning is how they wound up putting homes and schools on “cheap land” that is cheap because it is inside the blast radius. And the accident part is made very likely by the absence of safety regulations which again are a part of unregulated free enterprise. We don’t know for sure in this case, but there is a strong history of poor safety regulation at Texas chemical plants, especially BP refineries, for example. And the plant is on the northeast edge of town. Looking at the picture, I’m not seeing any grain elevators, so I’m pretty sure the silos are all apart of the fertilizer plant. If you zoom in, you can see the smaller trailers that the farmers get it in – those are the tandem units parked in the south end of the plant, and also a few larger tank trucks in the middle. Looking at the buildings and the streets, that part of West is the ‘new’ area. The original town is all south of the plant – you can tell by the square street grid. Appropriate name for the big cross street there N. Reagan. Maybe in the future they should rename it I’m from the Government and I’m here to help you Street. The fertilizer plant that exploded Wednesday night in West, Texas, reported to the Environmental Protection Agency and local public safety officials that it presented no risk of fire or explosion, documents show. West Fertilizer Co. reported having as much as 54,000 pounds of anhydrous ammonia on hand in an emergency planning report required of facilities that use toxic or hazardous chemicals. But the report stated “no” under fire or explosive risks. The worst possible scenario, the report said, would be a 10-minute release of ammonia gas that would kill or injure no one. WHOOPS!! Our Bad!! Now, watch this drive / how ’bout them (fill in blank with name of sports team/tv program etc etc)!! @Joey: That makes no sense. Proper zoning would have dealt with the proximity to the plant. The evidence that there was no proper zoning or regulation is right before our eyes. Galt all the way, even if it turns out to be something that was purposeful it was staged by the irresponsible nature of the powers that be. But. But. Who would insure the nursing home and school within the blast zone? Who would insure an unregulated chemical co.? The fact that they have a volunteer Fire Dept. says nothing about the towns low taxes that “they can’t afford” one. If you look into actual statistics of the fire service, 75% of all firefighters are volunteer in the United States, me being one of them but thankfully I’m in a combination department where we have both paid and volunteer staff. It’s just a sad tragedy that would have still had the same result if it had been a paid Fire Crew showing up instead of the volunteers. I was going to ask someone to remind me, who thinks Texas shouldn’t secede? But it’s probably too soon, huh? @Jerry: Thanks for that info. I wasn’t aware how high the percentage of volunteer departments is but I just found a census that puts it at 71%. Even with that, I feel that a facility with this amount of such dangerous material should be required to either fund a paid department or maintain its own paid fire staff. It’s unfair mooching by the business owners to expect volunteers to move into certain death when a facility like that catches fire. @Jim White: Exactly, I’m sure the response from Houston FD or Dallas FD would have been totally different and much safer for the Firemen. After the year that San Diego County had so many bad brushfires, they tried to get people to vote for a professional county fire department, and people turned it down because Higher Taxes. They’re still using volunteer fire departments, inadequate equipment and training be damned. @P J Evans: What floors me is the circular area just north of the two tennis courts, left of the plant. At maximum zoom, I can make out swings, teeter-totters and slides…all within 150′ of the really big, really decrepit storage tank on the fertilizer facility. I’m a recent grandparent and that image chills my blood. What could they have been thinking? Oh boy, a lot to go through here. As a resident Texan and a Galvestonian (right across the bay from Texas City) whose wife has worked in Texas City for 35+ years let me try to correct a few things about Texas City. The accident in Texas City had absolutely nothing to do with zoning or the lack thereof. Nor have the chemical companies in the area ever been particularly ‘chintzy’ when it came to paying taxes (well, until BP came along a few years ago but they’ve now worn out their welcome and sold out). The Galveston/Texas City area is one of the strongest Democratic areas in the state and has been for years. The whole area is zoned all over the place. These were ships on a dock. Have you ever been to any port city anywhere on the planet where there wasn’t populated growth close to the docks? Those explosions knocked out windows in Galveston – 15 miles away. Are you going to criticize every port across the planet that fails to restrict any building within 15 miles or more? Should the state have ordered all residents off the island when the docks were built in case something like this just might happen? C’mon, we can all criticize Texas for a lot of things but the chemical companies around here have never failed to provide the monies necessary to try to prevent a similar occurrence. Frak, when I got out of the Air Force a long time ago I went to work in the chemical lab at Carbide and had to go down on those docks all the time to take samples. I could smoke 5 joints each way going to and from the lab and no one cared but if I so much as got one step out of line on those ports they’d have fired me in a split second and my dad, who helped start the first union down there and ended up as a plant supervisor would have been the first one to do the firing. Fair is fair – I have no idea what happened in Waco but not all of Texas is some unregulated pile of dogshit. @Jim White: You say you’ve driven through that area (hope you had your Pat Green on the radio). You’ve seen it. How in the world are those people going to scratch enough profit out of that land for a paid fire department? You can’t be serious. Maybe something good can come out of this. Cheap land? Nice place for a park, in a buffer zone? Looking at the aerial, West looks like it was a nice place to live. I understand there is (or was) a bakery there with great kolaches, and they have a community cookbook – it’s an area that was settled by Czechs. No! Just the other 80% of the state, with the policy freely flowing from the mantle of legislative authority! We do know exactly what happens in TexCorp, and it isn’t any form of justice! Your state is the sphincter of the body Amerika. I think you should go back to sleep GCP; forever! what’s worse or more inane ? — living in a town with a fertilizer plant (| store |; thanks to the torpid bmaz for delimiting the discussion according to unassailable “facts”) or living in a town with a volunteer fire department? @Mary McCurnin: Your response doesn’t make any sense. So regardless of what caused the accident, even if it was sabotage, it is the company’s fault? I agree that appropriate zoning could have prevented the severe consequence but that is hardly the company’s responsibility. It is the responsibility of the government to enforce appropriate government policy. It may well be that lack of appropriate company safeguards or even pure neglect was the cause of this accident, but to automatically say that capitalism caused this accident is not only wrong, it is irresponsible. @P J Evans: I’m half Czech. They all came through Galveston and they’re mostly over in Central Texas. Every little town has a Czech bakery and a German butcher and there are hundreds of them no different throughout Central Texas. They’re the genesis of what is known as Central Texas bar-b-q with the way meats are smoked and sausages are made. Look up the Texas Bar-B-Q trail in that area. People come from all over the world just to drive up and down and eat brisket and sausages. Generally, those folks have managed to make a living off the land for a long time but they aren’t big (or even small) cities and the idea that all of them would have a public fire department is ludicrous to someone like me (and to them). It’s a tragedy what happened but if you think this is going to entice all those small little towns along the highways to go out and build public fire departments, well, it isn’t going to happen. Having said that, I certainly agree with those who say the authorities should make sure this isn’t related to some type of terrorism. It seems to me traveling through this state and others that there are literally thousands and thousands of similar situations across the country that could be exploited in the same way and they are much softer targets than those in the cities. @Joey: The reason a lot of these places aren’t zoned is because they grew haphazardly. Those that were lucky enough to have some type of central location along the freeways managed to survive. Those that weren’t are now mostly ghost towns. Some guy a hundred years ago had 1500 acres which has been subdivided through generations. Each generation did their own thing. That’s why there looks like there wasn’t any planning – because there wasn’t. I used to think that parts of Texas was somewhat ‘behind the times’. I went to Colorado for a company down here about 10 years ago to put in the infrastructure for them to build their computer network up there in a rural area. The people were still using party lines. In order to get the Internet into their building we had to take the signal out of the Cisco equipment at the nearest big city, convert it to radio and beam it off a cell phone tower down into a valley where we put a receiver on the top of the building. Calling up the telco and asking for a T-1? They didn’t even know what you were talking about and this is 10 years ago so it’s not only Texas that has a problem in rural areas. It’s actually a small, locally-owned business, not a big international corporation, and it’s not on a main road, or even close to the highway. Frankly, I think we’d be stunned at the prevalence of U.S. communities in worse peril than West, Texas, was. What I’ve seen in Pennsylvania and West Virginia alone makes Texas look pretty decent. Dear God, why won’t you people just give us the west half of the country, you take the east, and we can stop screaming at each other? The right and left are clearly beyond the point of rational conversation. Implying that this operation was beyond regulation is simply a lie, and insisting that the big city liberals know best when it comes to running small towns in Texas is laughable, if not condescending. But I don’t care. If you want to lie to your people to make your points, then go ahead. But just take the people that think your way is the only way and leave the rest of us alone. @GulfCoastPirate: I just think that somehow, during all the haphazard growth (most of which is harmless), someone has to realize that putting people and schools next to very large amounts of such dangerous materials is a really bad idea. And if they can’t afford to build a fire department, that’s an even stronger argument that a facility like this needs several miles of empty space so that tragedies are at least minimized. The prevalence of volunteer fire departments has a lot to do with the urban/ex-urban divide. In Texas, 71.9% of the registered FDs were volunteer in 2012 and another 13.7% were mostly volunteer. In Pennsylvania, it was 90.1% and 6.9%, in West Virginia, it was 91.3% and 4.1%. And New York, much of which isn’t urbanized? 89.9% + 4.7%. The Detroit News is saying that 1 is confirmed dead… so chalk up 1 dead to libertarianism, and millions dead to fascism, communism, progressivism, socialism, and other leftist political systems that seek to control citizen’s economic and political choices. How does that scorecard look now? Volunteer fire departments in New York City, that bastion of liberalism and high taxes: Aviation hose 3-Bronx, Edgewater Park VFD-Bronx, Gerriston Beach VFD-Brooklyn, West Hamilton Beach VFD-Queens, Broad Channel VFD-Queens, Roxbury VFD-Queens, Rockaway Point VFD-Queens, Point Breeze VFD-Queens, Oceanic H&L Co #1-Staten Island, Richman Engine Co.#1-Staten Island. It looks like someone is making it up as they go along, trying to make everyone to the left of center look bad. @P J Evans: I agree on the air quality thing. That all started when Bush came in as governor. There was a lot of relaxation of standards. @Jim White: I don’t necessarily disagree but whether anyone likes it or not there are certain cultural characteristics involved that go back a long time and criticizing those folks right after half their town blows up seems a little over the top to me. Word down here now is the firefighters originally on the scene may have fucked up by putting water on an ammonia fire and that’s what caused the explosion. @Phil Perspective: Of course it rings a bell. Yea, I was there starting in 75. That’s where I met my wife. Who was your dad? Maybe bmaz or Jim can send you my email address so you can reach me. Probably better than just posting it here. @GulfCoastPirate: Does your old email from RMAS days still work? I think I have that one somewhere. Before Texas plant exploded: What did regulators know? Despite being located within a short walk of a nursing home, school and residential buildings, West Fertilizer Company in central Texas had no blast walls and had filed no contingency plan to the Environmental Protection Agency for a major explosion or fire at the site. It remains unclear what safety measures, if any, were required of the company or whether West Fertilizer failed to comply. But on Wednesday night, the company’s fertilizer complex in West, Texas – population, 2,600 – exploded with such force that 60 to 80 homes were flattened, the school and nursing home took heavy damage and at least 14 people were killed, authorities said. In a filing earlier this year to the Texas Department of State Health Services, West Fertilizer disclosed that, as of the end of 2012, the company was also storing more volatile chemical compounds at the same address, including 270 tons of ammonium nitrate. The same type of solid fertilizer was mixed with fuel and used by Timothy McVeigh to raze the Oklahoma City federal building in 1995, killing 168 people. Sales of as little as 25 pounds (11 kg) of the substance are now tracked by the US Department of Homeland Security. It is time for the pathological avoidance of oversight to end in Texas. The explosion in West, which killed at least 14 people, is now entering a dark pantheon of events in Texas, ones that will surely lead to debates in the state about government regulation and oversight – or the lack thereof. About what “public safety” really means, implies, entails. About Texas’ passionate history of pushing back at what some see as big-government intrusion – a trend that traces back to the regulation-free days of wildcatting in the oil patches. As before, there will be demands that Texas be willing to scrutinize companies so tragedies like the one in West never occur again. But if history is any guide, lawmakers and officials will still err on the side of industry and less so on the side of public safety. And there will be another West in the years to come. The fertilizer plant that exploded on Wednesday, obliterating part of a small Texas town and killing at least 14 people, had last year been storing 1,350 times the amount of ammonium nitrate that would normally trigger safety oversight by the US Department of Homeland Security (DHS). Yet the company that owns the plant, West Fertilizer, did not tell the agency about the potentially explosive fertilizer as it is required to do, leaving one of the principal regulators of ammonium nitrate – which can also be used in bomb making – unaware of any danger there. Wednesday’s blast heightens concerns that regulations governing ammonium nitrate and other chemicals – present in at least 6,000 depots and plants in farming states across the country – are insufficient. The facilities serve farmers in rural areas that typically lack stringent land zoning controls, many of the facilities sit near residential areas. In response to a request from Reuters, Haywood, who has been a safety engineer for 17 years, reviewed West Fertilizer’s Tier II sheets from the last six years. He found several items that should have triggered the attention of local emergency planning authorities – most notably the sudden appearance of a large amount of ammonium nitrate in 2012. “As a former HAZMAT coordinator, that would have been a red flag for me,” said Haywood, referring to hazardous materials. Maybe I’m missing something, but it seems to me that in this case, having an established paid fire department should have been a non-negotiable. Yes, fire departments and firefighting equipment are expensive, but having the whole town go kablooey is expensive also, and tragic. But aren’t police departments and patrol equipment (vehicles, weapons, tactical equipment, etc.) just as expensive? And yet we would never dream of having volunteer police departments. What gives? What am I not getting? I’ve been through West a number of times; so has half the population of the state, since it’s right on 35. I’m having trouble wrapping my head around this, and I think a lot of people are as well, though the immediate needs of the people that have lost their homes trump the questions about regulation and “why the frak is a plant that can produce this level of destruction allowed to be in proximity to retirement homes, schools, and pretty much the whole town?” It’s, in a sense, worse than the mining disasters recently, because you can’t in any way blame this on an “act of God”; everything about this situation was under the control of the people in the town and the management of the fertilizer company. In other words, it didn’t have to happen in this way – certainly, industrial accidents happen, and people are killed; the attitude of many businesses in the end is “accidents will happen. Too bad. That’s why we have insurance.” To a certain extent that’s true. But this – this! – having this plant right in the middle of town (even if it was built before most of the structures that grew up around it) – how many details and how much explanation do we need to decide that the accumulated stupidity of the decisions that allowed this to happen is an order of magnitude beyond a screw-up. And I’m not trying to dump on the people – or even the management of the plant – that allowed this to happen. God knows what they’re going through. My point is that – well, let’s imagine that some government regulators had paid a visit to the plant the day before. And tried to, in some way, alter the situation. Their efforts would have been totally in vain; the business community and every single level of government in Texas is implacably hostile to any attempt at regulation. That’s a big deal to Rick Perry and his supporters when he visits California or Illinois to try to get businesses to relocate here, or tell Connecticut “We’ll be glad to have your gun manufacturers locate here!” This is – and this is important, it seems to me – an aspect of the state that the business community values beyond pearls.